Below you can view all the homes for sale in the Wood Creek subdivision located in Arvada Colorado. Listings in Wood Creek are updated daily from data we receive from the Denver multiple listing service. To learn more about any of these homes or to receive custom notifications when a new property is listed for sale in Wood Creek, give us a call at 720-580-6756. There is plenty of close parking for you & your guests as well as a beautiful outdoor pool. MLS#4291121. Keller Williams Preferred Realty. 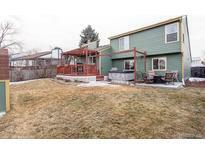 Out back you will love the large deck and expansive yard, perfect for a Summer BBQ with family and friends. MLS#6287606. Redfin Corporation. Large main floor living room with gas fireplace, skylights and attached spacious 1 car garage. You will love living here! MLS#4919200. HomeSmart Realty Group. Call now to schedule your personal showing! MLS#7239008. TRELORA. Visit www.Arvadacondo.org for more info and a video tour! MLS#9331314. Golden Real Estate, Inc..